Originally published in Communities Digital News. Last June, the Environmental Protection Agency (EPA) proposed its Clean Power Plan as a nationwide regulation to reduce carbon dioxide (CO2) emissions from electrical power plants. Comments to the EPA have now been submitted, and it’s not a surprise that a majority of state governments oppose the plan. In the best interests of US citizens, states should refuse to comply with the proposed EPA Clean Power Plan. The Clean Power Plan (CPP), more formally named the §111(d) rule, Carbon Pollution Emission Guidelines for Existing Stationary Sources, calls for a 30 percent reduction in power plant emissions by the year 2030. The CPP sets specific CO2 reduction targets for each state, based on four building blocks: 1) improved efficiency of coal-fired power plants, 2) increased use of combined cycle natural gas power plants, 3) increased use of renewable and nuclear energy, and 4) increased energy efficiency by consumers and businesses. But the main thrust of the proposal is the shut-down and replacement of coal-fired power plants, which now provide about 40 percent of US electricity. There are three major strikes against the Clean Power Plan. First, the authority assumed by the CPP is not granted to the EPA by the laws of the United States. Second, efforts to try to implement the CPP will degrade the finest electrical system in the world, hurting consumers and businesses. Third, if implemented, the CPP will not have a measurable effect on global warming. State electrical public service commissioners are tasked with providing reliable, low-cost electricity for the citizens of their state, while meeting environmental standards. Commissioners trade off the costs and benefits of hydrocarbon, nuclear, and renewable power sources, and they plan new power plants, electrical transmission lines, natural gas pipelines, and other facilities. CPP restrictions threaten to inflate the price and seriously degrade the reliability of US electricity for negligible environmental benefits. The State of Indiana requested that EPA withdraw the CPP proposal, predicting an electricity price increase of more than 60 percent due to EPA regulations. The State of Arizona commented that the CPP is “not technically feasible” and will “seriously undermine the reliability of electric service.” The Public Utility Commission of Texas alsourged the EPA to withdraw the rule, estimating compliance costs at over $20 billion and that Texas electricity prices would rise by more than 20 percent by 2020. NERA Economic Consulting estimated a consumer cost of up to $479 billion by 2031, or about $1,500 for each man, woman, and child in the US. Some states have shown support for the Clean Power Plan, led by California and New York. Both states appear to be in a race to achieve the highest residential electricity ratesin the lower 48 states. 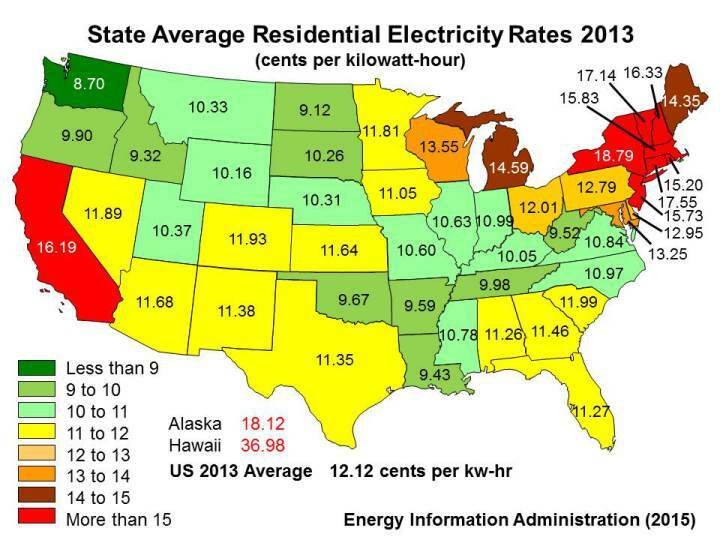 In 2013, California citizens paid 16.19 cents per kilowatt-hour, but New York was number one at a whopping 18.79 cents per kW-hr, well over the US average of 12.12 cents per kW-hr. Paradoxically, New York recently banned hydraulic fracturing of natural gas, a fuel that the CPP heavily promotes.